When we are truly passionate about something there is almost nothing that can take us away from accomplishing the task or goal we possess. For Hamilton Tiger-Cats defensive back Ryan Hinds, his passion and love for football can only be matched by one other thing, his desire to help the children in his home country of Guyana. The 2009 second-round pick of the Tiger-Cats was born in Georgetown, Guyana and moved to Toronto, Ontario at the age of eight, where he would develop his love and skill that would eventually lead him to the CFL. This past January, through what could be called fate, Hinds teamed up with Guyana Help the Kids and a few months later took his first trip back home in an experience that would inspire and ignite a passion within the 26-year-old. “I’m doing an informal internship at McMaster Children’s Hospital and I had mentioned to one of the doctors that I was from the country of Guyana and he actually does work in Guyana and has been doing it for about 10 years. When I mentioned to him that I’m always willing to help out he told me about the project that he was trying to undertake which was to open up a new pediatric ward in Guyana, in the main public hospital which is called the Georgetown Public Hospital,” Hinds explained. In March of this year, Hinds, alongside members of Guyana Help the Kids, went to Guyana to witness the country’s health care situation first-hand. The visit ended up being Ryan’s first in 18 years. With a goal of $75,000, fundraising efforts have taken place since their visit to Guyana and have included events such as charity dinners in both Hamilton and Toronto, and an upcoming event called Touch-a-Trailer, taking place at Hamilton’s Robar Centre on September 30th. The Touch-a-Trailer event is a family-based event that gives kids of all ages the chance to check out 30 different heavy machines we see everyday, as well as the chance to tour inside fire trucks, ambulances and various motorcycles. The event will be the third official fundraising effort by Hinds since March, and will be followed by many more. Though Hinds faces a large task, his ambition and drive comes easily and naturally. 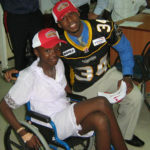 His push to make a difference is inspiring to not only those who look up to him in Canada, or CFL fans, but for the number of youth and children in Guyana that will one day receive the medical care and attention they deserve, what every child deserves. We are committed to finding ways to improve the quality of life for those living with HD and mitigate the harsh symptoms. That is why my fiancée, Allie LaForce, and I reached out to the Cleveland Clinic and Dr. Mayur Pandya to discuss ways to enhance the quality of life for HD victims.